I’m revisiting the Wall Street Journal article one more time, because it complements my favorite topic of the moment How Swimming Builds a Better Brain. Later this month, we’ll publish an ebook on that topic, which will be available as a free download. I’ll post interesting nuggets here. 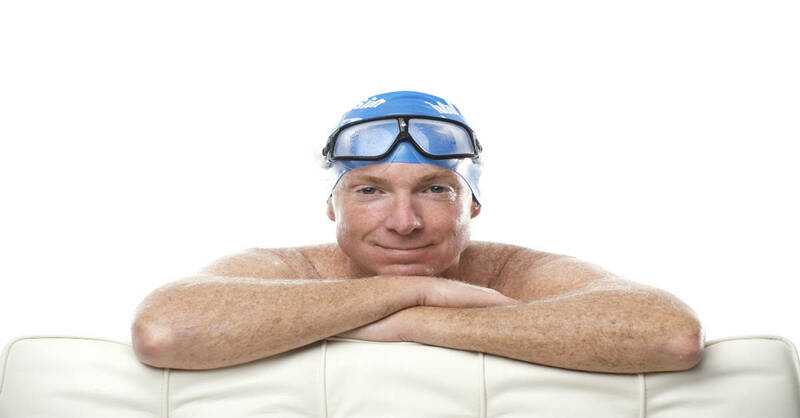 To recap: Journal reporter Kevin Helliker has swum freestyle for years but a lap or two of Butterfly leaves him exhausted. Noting that long-distance Fly has become a passion for some, he was curious if – after years of no improvement – someone like himself could learn to swim Fly for distance. His sources mainly advised to train much harder – and not just in the pool either. That’s a completely accurate description of Fly as most everyone swims it. It’s also the reason, I’d been unable to swim more than a lap or two for 40 years. At least until I began to think about solving the deceleration problem with streamlining, rather than a “huge surge of propulsion. Watching a Michael Phelps DVD I noticed that there was a moment between strokes when he just held his streamline while allowing gravity to draw him down, then buoyancy to bear him up again. I thought that was something I could imitate. After an hour of experimenting in an Endless Pool, I found I could keep swimming Fly as long as I wanted. (In the EP, with no turns, so it’s like swimming Fly in open water). How do you overturn 40 years of frustration in an hour? Well, obviously not by doing what you’ve always done. This is a perfect example of why improvement-minded swimming is ideal for Adult Brain Building. Researchers say that attacking Mental Autopilot – habitual ways of thinking – is a known stimulus for improving brain function. If you ride a bicycle down, then immediately up, a hill it would make no sense to brake near the bottom. Instead, you conserve momentum from the downhill to help carry you up. So why do swimmers aim for — indeed celebrate – an incredibly costly “huge surge of propulsion?” Isn’t this just like flooring the gas pedal in your car after every intersection? What made Butterfly-for-Boomers so “tireless” is that it solved the “deceleration problem” with streamlining rather than power. Conserving momentum is obvious in cycling, but not in swimming. Finding flaws in accepted ways of thinking, then developing strategies to act more effectively – followed by Deliberate Practice to convert new thinking into new skills – are proven brain builders. Another quote from the article seems to position Fly swimming as a poor-man’s alternative to the $15,000 ROM machine that promises you can be fit in just 4 minutes a day. “’Fifteen minutes of butterfly can provide similar benefits to 30 to 45 minutes of freestyle,’ says [Tom] Boettcher.” For me this hints a bit at the Fast Fitness philosophy (“Washboard Abs in just 5 minutes a week”) which treats physical activity as an inconvenient necessity that we should seek to squeeze in to our busy schedules..
For contrast, there’s the yoga class I took this morning, which brings essential balance to the headlong multitasking outside those walls. Giving myself fully to each down-dog, triangle or tree does to energize me mentally as align me physically. And so it is with Deep Swimming Practice. No longer do I watch the clock. Instead I relish every moment. In the holistic view, a healthier heart and stronger, more supple muscles become the icing on the cake while flow experiences, habits of mastery and excellence, and a healthier brain become the more conscious goal. Improve-oriented swimming is the perfect vehicle.